It all happens so fast. You enjoy your motorcycle ride when suddenly you find yourself laid out on the road or in a hospital bed. A driver wasn’t paying attention and hit you. Now you’re faced with pain and disability, huge medical bills, lost wages, and other life-changing damages. How do I get compensation for my damages? How do I hold the other party liable? How much will it cost to get professional legal help? At The Green Law Firm in Charleston, we have recovered millions of dollars for our clients. Our attorneys are experienced negotiators in motorcycle accident cases, and aggressive trial lawyers who do not settle for less. To get clients maximum recovery, we explore every option and explore every battle. Additionally, our firm operates on a contingency fee basis, meaning you don’t pay us when we sign you as a client, but when we recover money on your behalf. In other words, we charge no upfront fees. In 2012, motorcyclists accounted for 15 percent of all traffic fatalities, 18 percent of all occupant (driver and passenger) fatalities, and 4 percent of all occupants injured. Of the 4,957 motorcyclists killed in traffic crashes, 93 percent (4,625) were riders and 7 percent (332) were passengers. Motorcycles made up 3 percent of all registered vehicles in the United States in 2012 and accounted for only 0.7 percent of all vehicle miles traveled. Per vehicle mile traveled in 2012, motorcyclists were more than 26 times likely than passenger car occupants to die in motor vehicle traffic crashes and 5 times more likely to be injured. There is literally zero risk to consulting with us, so why delay? Call us today at 843.747.2455 to receive a FREE consultation. A Charleston Motorcycle Accident attorney can help determine cause as well as liability by conducting an investigation of the accident site. We can work with accident reconstruction specialists, medical experts, and other relevant professionals to piece together exactly how the incident went down. In South Carolina, cases arising from a motorcycle accident, and most other accident cases, must be filed within a certain amount of time after the date of the accident. If you fail to meet the deadline for your claim, you may be barred from pursuing compensation completely. Don’t risk losing out on your rightful recovery – contact our Charleston motorcycle accident attorney as soon as possible. Do your best to be visible to other drivers on the road. Most motorcycle accidents are connected to poor motorcycle visibility. By keeping your headlights on even during the day, wearing reflective gear, and equipping your bike with a proper windshield, you will have a much better chance that other drivers will see you. Get adequate training. Motorcyclists have proper training, and care for their bikes are less likely to be involved in a motorcycle accident. Training and experience may help you respond to a dangerous situation in time to avoid a collision. Wear the right riding gear. Your best protection against a serious injury in a motorcycle accident will be your helmet. Wearing a helmet is a simple way to reduce the chance that an accident will be fatal. Proper eye protection is also important. Wind and glare can reduce your ability to see and respond to objects in your path. Though many motorcyclists are careful when riding, accidents sometimes still occur. 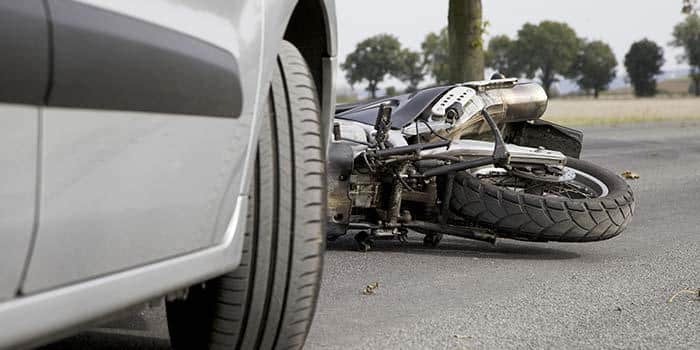 When that happens, you should take measures to ensure your legal rights are protected by contacting a motorcycle accident lawyer from the Green Law Firm in Charleston. Despite preventative actions taken by motorcyclists, accidents still happen, and the cost can be significant. The financial burden incurred through motorcycle accidents can stack up due to lost wages and expensive medical bills. Get the contact and insurance information from the other driver. Take pictures of any damage and injuries. Seek medical treatment where appropriate. Keep copies of all the police and medical documents describing the accident and your injuries. These will help your case if you choose to pursue legal action. If you do wish to file a claim, contact the motorcycle accident lawyers at The Green Law Firm. We are here to protect our clients’ rights and to help them get the compensation they deserve. If you or a loved one has been injured in a motorcycle crash, contact The Green Law Firm today for a FREE case evaluation. We handle most cases on a contingency basis, meaning we only get paid if you do. Most lawsuits have a limited time frame in which you can file before you waive your rights to seek possible compensation, so act quickly.